Last week, I started to feel uninspired by main dishes and more enthusiastic about desserts. Working full time doesn't leave me a ton of time to make a full meal AND a dessert, so thankfully my co-pilot was happy to take on all of the main meals for a bit. In fact, he was elated to get his time in the kitchen. He loves to cook as much as I do so this wasn't a "task" or "chore" by any means. The one thing I love about Todd's cooking is that he is very good at melding flavors. He knows how to use the spice rack correctly to get the most out of every ingredient he puts in a dish. Everything always compliments each other and because we cook such different foods, I am never bored with anything he fabricates. 1. Vigorously salt and pepper chicken breasts. In a large skillet, melt butter over medium heat; brown chicken on all sides. Remove from pan and keep warm. 2. In the pan drippings, sauté onion, jalapeño, and celery until tender. (About 6-8 minutes.) Add the remaining ingredients and cook and stir until jelly is melted. Return chicken to pan. Cook chicken in sauce, uncovered while continuing to spoon pan mixture over the breasts. Continue glazing chicken for 30-35 minutes or until chicken juices run clear. Remove skin if desired. Top chicken with onion mixture. Whatever you do, DON'T leave this sauce in the pan. 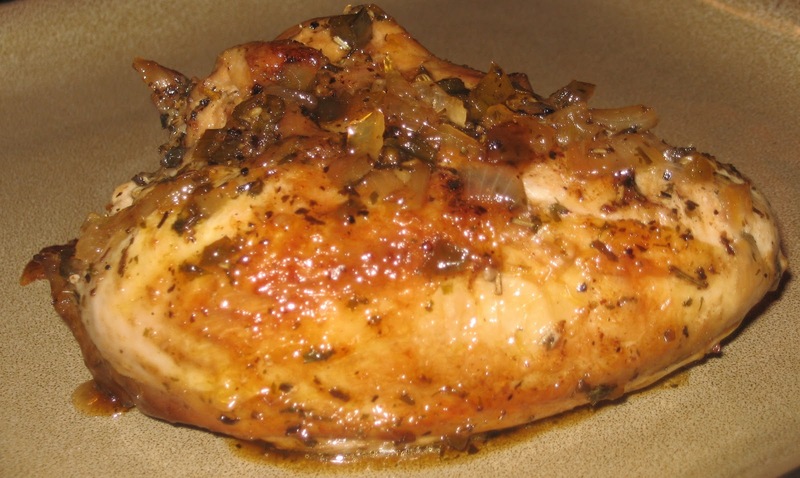 Make sure you drizzle every last drop of it onto your plate as that is what makes this chicken so very tasty! I am pretty sure this dish could make a vegetarian eat chicken!